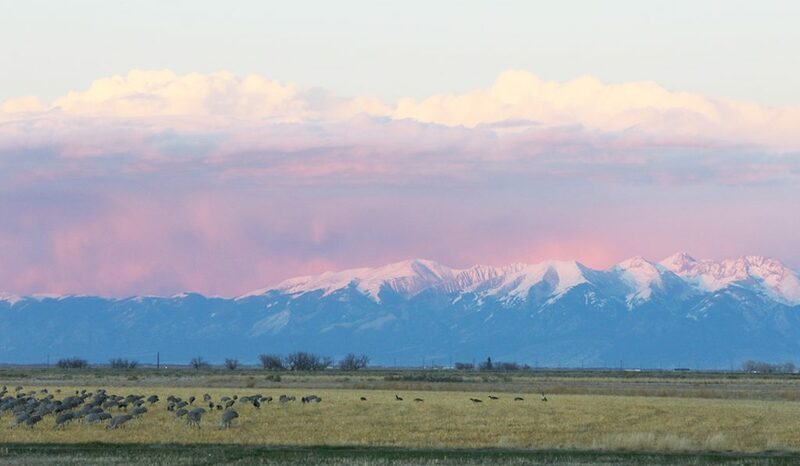 Every spring, tens of thousands of sandhill cranes descend upon Colorado’s scenic San Luis Valley to feed and rest up for the journey further north to their nesting grounds. It’s a wildlife phenomenon akin to the celebrated march of the penguins in Antarctica. But instead of the penguin’s gakkering and growling, birdwatchers hear the trumpeting of five, six and ten thousand cranes, whose rattling call sounds something like a cross between a tiger’s purr and pigeon’s coo. “When you have 5,000 cranes all making their rattling calls, it can be deafening,” says Scott Miller, wildlife biologist for the Monte Vista National Wildlife Refuge, where most of the 25,000 cranes congregate in early spring. This year’s Monte Vista Crane Festival includes sunrise and sunset tours, photography workshops, raptor tours, fieldtrips to the Great Sand Dunes National Park and Penitente Canyon and more. There’s a daily craft and nature fair with local artists, and Friday night’s movie is “Hoot”— about a group of young friends on a mission to save burrowing owls. The 2017 keynote speaker is avid birder and Colorado Breeding Bird Atlas illustrator, Radeaux. The festival runs March 10-12. For details and registration, visit mvcranefest.org.